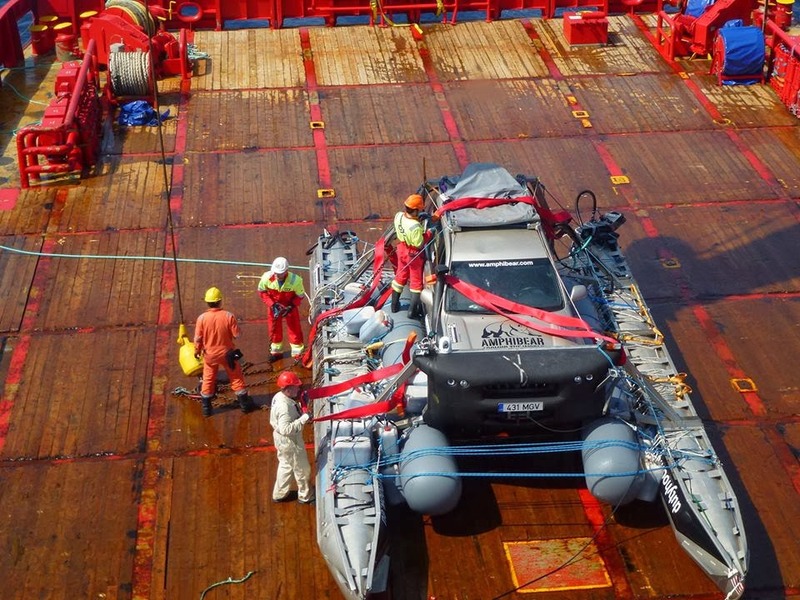 GEOHOLM lifted Amphibear on board. 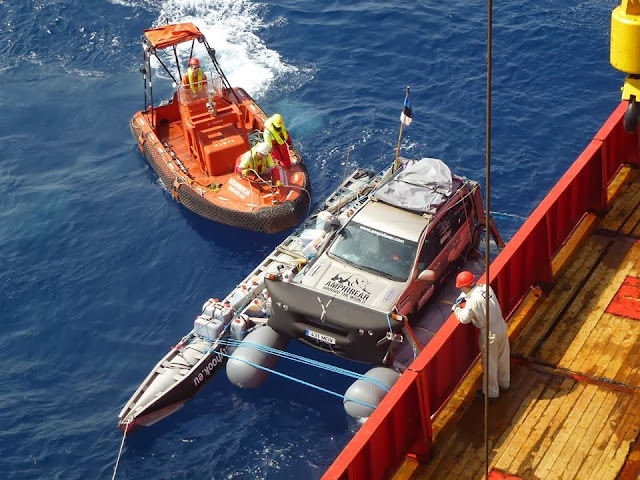 The captain said that despite Amphibear’s small size it was still a difficult task because the vehicle kept rolling hard in the waves. Big thanks to captain Reinold Leder, the entire crew of GEOHOLM and Norwegian company Dof Managament Storebo, who permitted their expensive private vessel to search for Amphibear and take it on board. Incredibly nice and hard-working people! Another incredible thing was the action taken by the support crew. Erki and Kristjan monitored vessels in the vicinity and looked for all the contacts and the lifting power of the cranes. They sent me messages via satellite about who I should contact over the VHF. The officers on HARU were kind enough to allow me to use the VHF aboard their ship. So I received a message that Geoholm was the only capable ship in the area. I could not get in touch with the owners. For NFC I was out of the connectivity area. The support crew calculated that the nearest we were to each other was last night around 23.00 or 24.00. We could not get in touch by sending a message from the HARU bridge. Then, at 23.30, the third steersman of Haru announced that the radar picked up GEOHOLM AIS. No-one answered the call on the bridge. We finally got in touch just before midnight. The captain who we awoke turned out to be the kindest sleepy person so far we have communicated with over the radio. We swapped satellite phone numbers and further communication was a piece of cake. Everything was now up to the captain and his crew. Of course, finding Amphibear was not that easy. It took about two hours. However, the calculations by the support crew allowed us to find it eventually. Geoholm’s port of destination is Rio de Janeiro, Brazil. Inevitably, Amphibear will now cross the Atlantic ocean by sailing aboard a big ship. Though it is safer and more convenient, it was not the original plan. In order not to trouble the compliant Norwegian company and the captain with customs, I promised to meet the vehicle with all the paperwork. Which means that both me and Amphibear will get to the other side of the Atlantic ocean without crossing it. After that, three choices remain as always: go forward, go back, or cancel. Cancelling would be like letting down all our supporters; as long as we have the vehicle and it can be fixed, we should keep on going. Unless, of course, we run out of money with the rescue operation. Perhaps we won’t... I would like to cordially thank everyone who instead of laughing at me, decided to help. It seems pointless to come back, especially because I can transport the vehicle with the pontoons to the Canadian factory (or to some aluminium boat factory) and take some more serious action there. At the moment, it is the pontoons that are the weakest link in the entire solution. So the most reasonable choice is to continue the journey from Brazil. But the justified question about the Atlantic emerges. We have to traverse the Caribbean sea, the Pacific Ocean, and the customs of all the countries. Therefore, we should continue the journey, and if we do manage to carry out the rest of our ambitious plan, we can return and cross the Atlantic ocean as well. After the Bering sea, the Atlantic might serve as a vacation. The first task, of course, is to clarify the condition of the vehicle and fix the damage of the pontoons and the car. The other task is to find supporting ships for crossing the sea that are capable of towing (the ships can be found, what we actually need to find are the finances). And we need two crew members. Now that there is a solution for taking fuel along, two crew members increase the speed, providing helping hands for repairs at each phase.